China’s crackdown in Xinjiang province has attracted increasing international attention over the past year. All Muslim groups in the region are now finding themselves targeted, new research suggests. And the internment camp system has evolved into a hierarchy of punishments, ranging from the loss of travel privileges to forced labor to incarceration. Mehmet Volkan Kasikci, a Turkish researcher who gathers the testimonies of survivors and their relatives in Kazakhstan, asserts that simply being on the receiving end of an email from abroad is now sufficient cause for an extended stay in the camp system. “Contact with the outside is now the number one reason” for Muslims in Xinjiang being confined, he said. Kasikci estimates that roughly 10-to-12 percent of the Uighur, Kazakh and Kyrgyz population in Xinjiang is now cycling through the various levels of Beijing’s coercive reeducation and forced labor system. There are an estimated 12 million Uighurs overall in Xinjiang, along with roughly 1.5 million Kazakhs and 220,000 Kyrgyz, along with smaller numbers of Tatars and Uzbeks. Those groups are culturally Turkic and Muslim. But Beijing is now also rounding up members of an ethnically Chinese Muslim group known as Dungans, or Hui, he says. Since the collapse of the Soviet Union, roughly 200,000 ethnic Kazakhs have left Xinjiang and moved to their titular homeland, Kazakhstan. “Almost all of these Oralman [emigres] now know someone who is in a camp,” Kasikci, a doctoral student at Arizona State University, told Eurasianet. The role of Kazakhs in shedding light on the camp system threatens to strain relations between Kazakhstan and China. Earlier in March, Kazakhstani authorities detained an outspoken activist, Serikzhan Bilash, the leader of an unregistered Almaty-based organization, Ata-Jurt, which has played a leading role in exposing details about the crackdown in Xinjiang. Bilash, who was accused of stirring up ethnic hatred, is now under house arrest. Chinese officials have justified the camps as a necessary measure to keep terrorism and separatism in check. Uighur radicals have carried out violent attacks against Chinese targets in recent years as a form of extreme resistance to what they describe as forced-assimilation measures. On March 26, the official Xinhua news agency reported a top Communist Party official, Wang Yang, as saying “the general situation in Xinjiang has been continuously stable and keeps on improving, and people's sense of gain, happiness and safety keeps growing.” The report made no specific mention of the camps, but hinted that the system could be expanded. 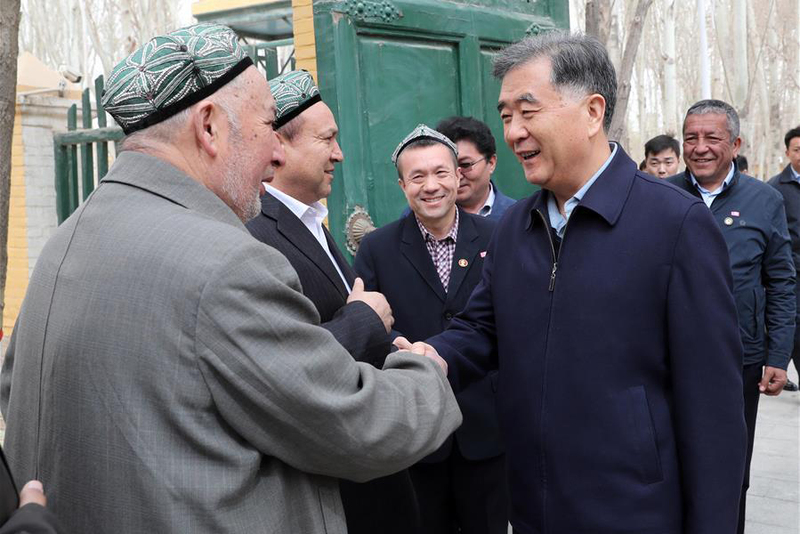 Wang, who had just completed a visit to Xinjiang, also stressed a need to address widespread poverty in the region. Wang’s statements, combined with the fact that all Muslim groups in Xinjiang are now being subjected to internment, suggest that Beijing is moving far beyond its original goal of containing radical resistance and is striving to culturally bulldoze the region. Kasikci compares the Xinjiang camp system to that established by the British in South Africa during the Boer war in the early 1900s. The British practice of confining mainly Dutch-speaking farmers in South Africa gave birth to the term “concentration” camp. A primary objective of the Xinjiang crackdown is the elimination of alternative centers of authority. For this reason, “almost all the imams” in the region have been sent away for reeducation, Kasikci said. Kasikci describes five levels of punishment for those who run afoul of authorities in Xinjiang. The harshest level is prison, followed by internment camps and forced-labor factories. Less harsh levels are house arrest and passport confiscation, which, in effect, restrict an individual to his or her town or city of residence. Relatively few of those ensnared in the crackdown have been found guilty of any crime. Thus, the prison population of Xinjiang Muslims is comparatively small. The vast majority is dispatched to internment facilities, where detainees endure prolonged periods of indoctrination. Those deemed sufficiently “reeducated” often “graduate” to work in forced-labor factories, Kasikci said. In many cases, detainees work in the factories by day and return to the camps to spend the night. The factory-camp regimen is a relatively recent phenomenon, with the practice beginning in the middle of last year. Virtually all those released are then subjected to house arrest. Specific conditions inside the internment camps are difficult to pin down, Kasikci says. In camps housing those deemed most unreliable, detainees can be subjected to some forms of torture, he said, citing witness accounts he has gathered. Apparently, an individual’s level of religious devotion and Chinese-language ability are factors determining where a detainee is sent. Those who are more devout and less fluent in Chinese are apt to be dispatched to the toughest camps. Even at camps with the easiest regimens, detainees are given access to toilets for only two minutes per day, Kasikci has found. Many detainees who have been released show symptoms of post-traumatic stress disorder: some are so shell-shocked that they don’t immediately recognize family members, he says. Kasikci bases his assessments on the reports of mainly ethnic Kazakhs who have relayed accounts of their experiences to friends and relatives in Kazakhstan. A small number of former detainees have even made their way to Kazakhstan. Yet many of these individuals are reluctant to disclose details about their experiences because officials have threatened that friends and relatives still in China will face punishment as retribution. However a few former detainees now abroad – such as Sayragul Sauytbay, who is awaiting an asylum hearing in Kazakhstan – have spoken expansively about their ordeals.